Confused by the industry lingo that comes into play when shopping for appliances? Not anymore! We created this handy glossary to help you understand the different styles and features of whatever appliance you plan to purchase. ADA Compliant - Label that signifies a product’s compliance with the standards of accessibility required by the Americans with Disabilities Act; products that may carry this label include cooktops, dishwashers, microwaves, ranges, refrigerators, wall ovens, warming drawers, washers, and dryers. Advantium - A line by GE that highlights microwaves and wall ovens which use halogen bulbs and microwave energy to produce heat to cook faster. Agitator – A part in top loading washers that rotates back and forth to wash your clothes. Batch Feed - Type of Garbage Disposal that turns on when the lid is engaged; safer for children who are often in and out of the kitchen. Beverage Center - Type of Refrigerator specifically designed for storing drinks in cans or bottles. Bottom Freezer - Type of Refrigerator on which the freezer compartment is located below the refrigerator compartment. Bridge element - Feature of Cooktops and Ranges which allows you to connect two burners; increases your cooking surface to accommodate larger pots and pans. Brillion - A free app by GE allows you to remotely access and manage your appliances, like ranges and wall ovens, dishwashers, refrigerators, washers and dryers, even hot water heaters; compatible with iPhones and Android phones. BTU - British Thermal Unit; a unit of measurement used for gas appliances, including Cooktops, Wall Ovens, Ranges, and Grills. CFM - Cubic Foot per Minute; a unit of measurement used to determine how much blower power you need in your ventilation system. Charcoal - Fuel used in some models of Grills. Chest Freezer - Type of Freezer designed to store fresh produce, fresh meats, or foods you buy in bulk, for long periods of time. Climate Keeper2 Technology - A feature unique to GE Refrigerators; uses sophisticated sensors and a multi-flow air system to maintain the ideal level of humidity and help keep food fresh. Coil element - Style of burner found on electric Cooktops and Ranges that uses a coiled metal element to heat pots and pans. Continuous Feed - Type of Garbage Disposal that turns on when you flip a wall switch. Control lock - Aka child lock; very important safety feature which prevents children from using the controls of an appliance or opening it while it’s on; this feature can be found on many models of Cooktops, Dishwashers, Microwaves, Ranges, Refrigerators, Wall Ovens, Washers, and Trash Compactors; also some Dryers. Convection – Type of heating element found in Wall Ovens, Ranges, Warming Drawers, and some Microwaves that is good for baking, broiling, browning, crisping, and roasting. Convertible - Venting that originally redirects ventilation externally (outside of your home) but can be changed to recirculating with the right components installed. Cooktop - Surface heating element used for cooking; does not include an oven. Custom Cool Technology - A feature unique to GE Refrigerators that have a temperature-controlled drawer that is highly customizable based on your needs. Detergent dispenser – A part on Washing Machines that delivers detergent, as well as bleach and fabric softener in some models, at certain times during the wash cycle. Downdraft Vent - Ventilation installed close to the cooking surface that pulls exhaust down using a powerful fan or blower. Drip bowl - Included with many models of coil cooktops and ranges; collects food drippings into a removable bowl to make cleaning easier. Drop-in - A type of range that is installed on top of a toe-kick plate instead of a warming drawer or storage compartment. A dying trend, with most people opting for slide-in ranges instead. Dual fuel - An appliance that uses both electricity and gas; most common are Ranges with gas and electric ovens; a handful of models of dual fuel Cooktops and Wall ovens may also be available. Ducted - Venting that redirects ventilation externally (outside of your home) through ducts. Energy Star - A certification granted by the US Department of Energy and the US Environmental Protection Agency that labels an appliance as energy-saving; appliances that may be Energy Star certified include Dishwashers, Refrigerators, Washers and Dryers, and some microwaves; ventilation can also carry the Energy Star label. Food disposer - Dishwasher feature that grinds up large left over food particles on your dishes and flushes them out. 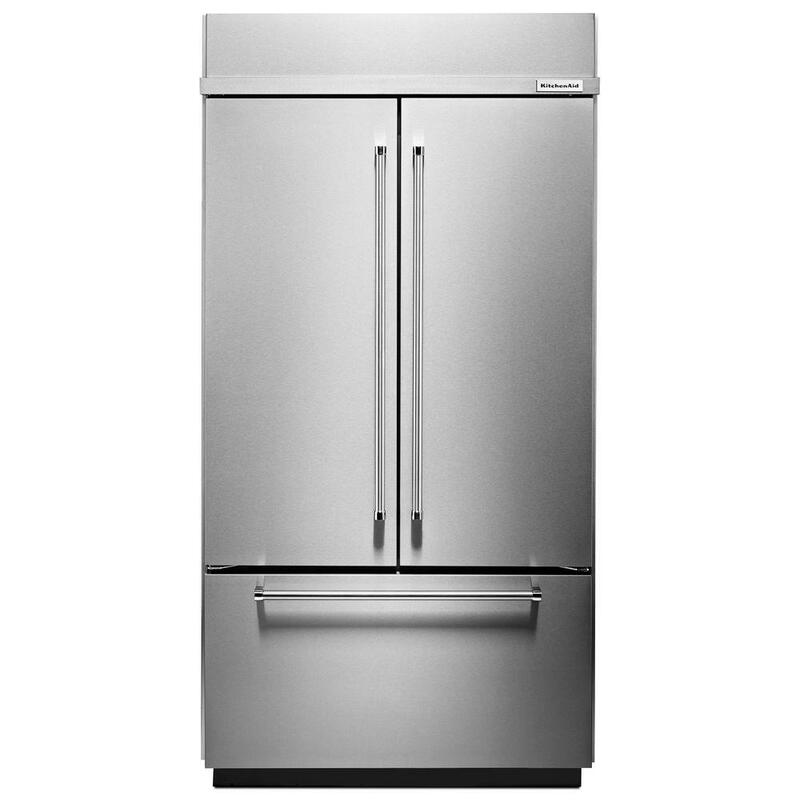 French door - Type of Refrigerators which features a side-by-side refrigerator compartment with the freezer compartment below. Front load - Washers and Dryers with their door located on the front of the machine; may include a window through which you can view your clothes. Good Housekeeping seal - Label that signifies a product’s evaluation by the Good Housekeeping Research Institute for performance quality and fulfillment of advertised features; products that may carry this seal include Cooktops, Dishwashers, Microwaves, Ranges, Refrigerators, Wall Ovens, Washers, and Dryers. Hidden bake element - Feature on some Wall Ovens and Ranges that covers the baking element; helps make cleaning easier. Holiday mode - A feature on some Refrigerators, that automatically switches your settings to a slightly higher temperature to help save energy if/when you are away for an extended period of time. Note: This setting will not support storage of most foods. Hot surface indicator - Safety feature found on some models of Cooktops and Ranges that lights to warn you when the cooking surface is still too hot to touch. HP - Horsepower; a unit of measurement used to determine the power of appliances such as Trash Compactors and Garbage Disposals. Induction - These heating elements can be found in some electric Cooktops and Ranges; requires magnetic pots and pans because it uses electromagnetic energy to create heat; a safer option for cooking. Intake valve - Transports water from the home water supply into the Dishwasher thanks to water pressure. Island Mount - Type of ventilation that is installed on the ceiling above a cooktop on an island or peninsula in your kitchen. Jets - Parts of a Dishwasher that spray water on dishes while rotating to clean them. Laundry center – A Dryer stacked on top of the Washer making them one unit; excellent for homeowners working with limited space. Liner - Type of Ventilation that is installed underneath a custom hood in your kitchen; these may be above an island, a peninsula, or a cooktop against the wall. Liquid propane - Fuel used in several models of Cooktops, Grills, and Ranges; occasionally found in Wall Ovens. Meat probe - Some Ranges include a built-in meat probe enabling you to check the temperature of your roast, turkey, or any other meat you may be cooking to ensure that it comes out just right. Moisture sensor - Dryer feature that detects the amount of moisture in the drum; helps prevent over-drying. Natural gas - Fuel used in several models of Cooktops, Grills, Ranges, Wall Ovens, and Dryers. Non-ducted - Venting that is duct free; ventilation is internally directed (back into your kitchen). Open burner - Style of burner found on Gas Cooktops and Ranges that has a wide opening where pots and pans are placed. Oven - Enclosed heating compartment used for cooking food. Overload protection – A safety feature of Garbage Disposals that automatically turns them off if they begin to overheat. Over-the-Range - Type of Microwave that is installed directly above the range. Pedestal - Optional accessory that can be purchased for a Washer or Dryer; raises the washer or dryer to a more ideal height and includes a drawer for storage. Precise Fill Technology - A feature unique to GE Refrigerators that delivers the exact amount of water you need; measurements can be in ounces or cups. Proof - A mode found in Ranges, Wall Ovens, and Warming Drawers that helps yeast rise when baking foods such as bread, rolls, and homemade pizza dough. Quick Freeze Technology - A feature unique to GE Refrigerators that freezes meats faster to help keep them fresher. Quiet Power 7 Sound Package - A feature unique to GE Dishwashers that uses a hidden vent to help trap sounds during the wash cycle for quiet operation. Raised vent - Ventilation installed near the cooktop which pops up while in use and vents exhaust with a fan or blower. Range - Includes both a cooktop and an oven; aka a stove. Recirculating - Venting which directs ventilation internally (back into your kitchen); great when no form of exterior exhaust is available. Ribbon heating element - Type of heating element found in Smooth-top Cooktops and Ranges. RPM - Revolutions per Minute; a unit of measurement used to determine the spin speed of a Washer or the tumble speed of a Dryer. Sabbath mode - Feature available on some models of Refrigerators, Wall Ovens and Ranges that alters the appliance’s use of electricity to conform to kosher practices for the Sabbath. Sealed burner - Style of burner found on Gas Cooktops and Ranges that is recessed below the cooking surface. Side-by-Side - Type of Refrigerators where the freezer and refrigerator compartments are next to each other vertically. Smart Dispense Technology - A feature unique to GE Dishwashers that stores the equivalent of a full bottle of liquid detergent and automatically dispenses the needed amount. Smooth top - Style of burner found on electric and induction Cooktops and Ranges that has a ceramic, glass, or porcelain cooking surface for a modern appearance. Speed Cooking - A feature unique to GE Ovens that uses Advantium technology to cook food through with the power of light. In addition to the conventional oven, radiant heat is created by halogen bulbs above and below the food to add a boost of microwave energy, cooking your food quickly and evenly. Splash guard Stops water and food from splashing up and out of the sink when a Garbage Disposal is in use; may be within the disposal itself or in the mouth of the sink; wears out over time and needs to be replaced. Top load - A Washer or Dryer with the door on the top. Top Freezer - Type of Refrigerator where the freezer compartment is above the refrigerator compartment. Trim kit - Optional kit that can be purchased with a Trash Compactor, Microwave, or Refrigerator; integrates the unit better with your existing countertops or cabinets allowing for more kitchen customization. Turbo Cool Technology - A feature unique to GE Refrigerator that automatically lowers the temperature to compensate for how often the door is opened. UltraFlow100 - A feature unique to GE Refrigerators, that delivers filtered water at a rate of 100 ounces per minute. Under Cabinet - Type of Ventilation that is installed under kitchen cabinets above your cooktop which hide the duct work. 120 Volt - The level of power required for many appliances; make sure the voltage level on your appliance matches the voltage output of your home; a step-down transformer is required to operate a 120 volt appliance from a 240 volt power source. 240 Volt - The level of power needed for some larger appliances which require more energy; make sure the voltage level on your appliance matches the voltage output of your home; a step-up transformer is required to operate a 240 volt appliance from a 120 volt power source. Wall Mount - Type of Ventilation that is installed on the wall above your cooktop. Wall Ovens - Only has an enclosed heating compartment for cooking food; does not include a cooktop. Warm zone - A part of the cooking surface, of some models of Cooktops and Ranges which keeps food warm without over-cooking it. Wine Chiller – A Refrigerator specifically designed for wine bottles, chilling them to the ideal serving temperature.